Andrew Reynolds is an Associate Professor of Spanish at West Texas A&M University. He is the author of The Spanish American Crónica Modernista, Temporality & Material Culture (Bucknell, 2012) and the co-editor of Behind the Masks of Modernism (University Press of Florida, 2016). Reynolds has recently published articles in Revista Iberoamericana, Decimonónica, A Contracorriente and Latin American Literary Review. 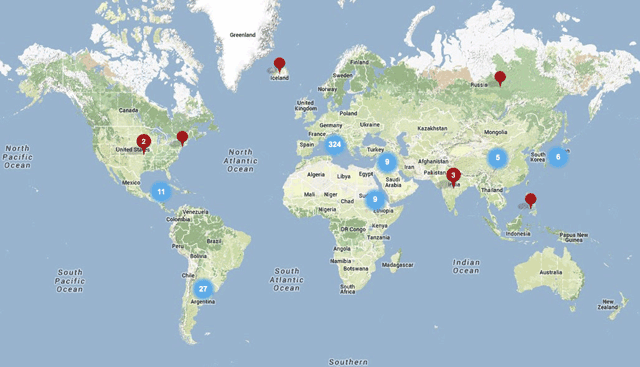 This study investigates how digital mapping of lyrical spaces and publication statistics illuminate modernista participation of the global literary field. Using gathered spatial data points from poetic editions from Rubén Darío and Amado Nervo reveal a rich intertextual and geospatial web. The cosmopolitanism and globalized erudition of modernista writers granted them wide access to seize world cultures and created a hybridized conglomeration of spatial elements in their poetic expression. The article then shifts to the mapping of literary production of Darío and Enrique Gómez Carrillo. Through data collection and geographic mapping of the writers’ book and journalistic publishing, levels of transnationality come into focus revealing previously unseen patterns of print and communication technologies at the turn of the 20th century. Tools of data collection and mapping prompt a greater understanding of the narrative of the modernista movement. Instead of leading to unambiguous and objective results, mapping spatial elements of the period lead to further questions that have the potential to open up the literary history of the fin de siglo to lines of inquiry that are not yet fully explored. In 1897, during his stay in Buenos Aires, Rubén Darío announced: “Somos ya legión y contamos con treinta y cinco revistas en todo el continente. Bueno y malo: de todo eso va a salir la idea de América, que Europa va a descubrir dentro de poco” (qtd. in Torres 409). One year after the publication of his groundbreaking book Prosas profanas, Darío proclaims that modernistas are a multitude, a force that will define the region. This influence will be accomplished through what Darío describes as thirty-five magazines published in the Americas. The poet, claiming cultural authority through modernista expression by way of journalistic production, views this success ironically in both positive and negative terms. For Darío, the conceptualization of the Americas is wrapped up in literary production published in commercial magazines that, judging from his other texts on journalism and the publishing industry, was a net positive for the literary movement.1 By contrast, we must read the second clause as “malo” – that Europe is going to “discover” the Americas once again. The idea of a European “discovery” is opposed to modernismo’s own appropriation of transatlantic literary authority in the field of cultural production at the turn of the twentieth century.2 This conflict in mapping the discovery of Latin American literature reveals questions of literary and publishing spaces and geographies. This study is an exploration of these spatial markers through visualizations created by textual and historical data of the modernista movement transferred onto digitized maps and graphs. These visual representations point to a confirmation of the modernista “legion” as it stretched from Darío’s group of revistas to extensive book publishing and a poetic expression founded in global literatures and spaces. Guatemalan cronista Enrique Gómez Carrillo discussed modernista travel in a similar way: “Por mi parte, yo no busco nunca en los libros de viaje el alma de los países que me interesan. Lo que busco es algo más frívolo, más sutil, más positivo: la sensación” (“La psicología” 7). This search for sensation was made manifest in the establishment of a literary field that spread across the Atlantic. The modernista notion of liberty of experience, curiosity and esthetic innovation led to a movement based on growth in numbers of both writers and consumers. This brings us back to Darío’s thirty-five magazines that were so central to the dissemination of modernista rhetoric in the Americas and abroad. How does this transatlantic circulation and global literary expression and experience, plotted on maps, help in understanding the first cohesive literary movement to emerge from the continent? Mapping visualizations expose relationships and tensions in modernismo’s literary dissemination, textual influences and cultural authority. This investigation contains two sets of maps: first the geographic spatial references from two modernista tomes of poetry, Amado Nervo’s En voz baja and Darío’s Prosas profanas. Then, historical data on Darío’s periodical publishing and Enrique Gómez Carrillo’s book production, plotted on a world map, illustrates the spatial limits of the modernista print industry. This gathered data helps to construct a spatial analysis through the theoretical mediation of the visible cartography of textual elements and statistics of literary production of the movement.3 Like Franco Moretti, I view that in this project: “Placing a literary phenomenon in its specific space – mapping it – is not the conclusion of the geographical work; it’s the beginning. After which begins in fact the most challenging part of the whole enterprise: one looks at the map, and thinks” (“Atlas” 7). In a similar manner, this series of maps and graphs documenting modernista poetry and literary production depicts contours of modernismo that uncover questions about the movement, inviting additional perspectives on the Spanish American literary history of the period. In using maps as a discursive tool, it is not the hope of this project to make some grand new literary discovery. Rather, as Ted Underwood has recently stated, “the discipline moves forward dialectically. You take something that people already believe and ‘push against’ it, or ‘critique’ it, or ‘complicate’ it. You don’t make discoveries in literary study, or if you do they’re likely to be minor […]. Instead of making discoveries, you make interventions.” The idea here is to “move forward dialectically,” exploring notions of the modernista movement through maps and graphs to see what data-centered images can provide in terms of our understanding of the period.4 Moretti further suggests that maps demonstrate a “matrix of relations” and “emerging qualities, which were not visible at a lower level” (“Graphs” 53–4). He also explains that maps are models that reorganize literary structures and that cartographic data has the potential to reveal “hidden patterns” not seen before (“Graphs” 54). The patterns revealed in the maps may not be all that surprising given what we know resulting from a century of extensive modernista criticism, but the reorganizing that happens when we plot out literary texts on a map may suggest divergent models in the literary history of the modernista period. For example, mapping place names and references in two of Nervo and Darío’s books of verse published more than a decade apart signals a constant eurocentrism in the poetic spaces represented in their poetry. It also brings about questions of the perpetual appropriation of the foreign by modernismo in the search for its own regional modernity. The periodical and book production maps contrast local newspaper publishing with the fledgling book field of Latin America, and the well-established book publishing houses of Europe that were keen on printing book after book of modernista literature. Here the maps help to explain modernista popularity at home as they published in newspapers and magazines in the Americas, coupled with their transatlantic authority, as represented through European booksellers and readerships. The spatial relationships embedded in the literary maps here and the connections between author, text and place overshadow the authority of the map boundaries themselves. As he published widely in Latin America and Spain, Rubén Darío is relevant because of the consequences and prestige of the spatial markers produced by Darío himself and the published work of his career. In other words, the textual geographies of the Nicaraguan poet were not produced by chance and reveal a transnational intentionality that permeated modernismo. Along similar lines, the location references in a Nervo poem matter as collective objects that we can extract, compare and view through a mapping instrument. Therefore, as Harley emphasizes, a hierarchization of practice appears where we draw out geographies from the location sources to better understand and interpret differently the literary text as an esthetic object. In this way, we move toward fresh and different interpretations and shed new light on the text as art. The cartographic hermeneutics here should not be viewed as an objectification of the spatial “realities” of the poetry or sites of publication. Instead, the mapping is an interpretive theorization performed by visual means, extrapolating from the works intriguing and valuable connections as they depict poetic elements and the journalistic and book production of the modernista movement. In another study, Harley has noted that maps should be read as “value-laden images,” and that they should “cease to be understood primarily as inert records of morphological landscapes or passive reflections of the world of objects, but [be] regarded as refracted images contributing to dialogue in a socially constructed world” (“Maps, Knowledge” 129). The idea of refraction is useful in opening up new viewpoints limited by other forms of textual analysis. Spatial relationships that have been plotted on a map, found in a literary text or through events of literary history are difficult to explicate outside of their visual dimension, hence the need for an observable delineation – as incomplete, partial, supplementary and “refracted” as it is – in order to achieve this additional reading. The relationship between geographic space, literature and cultural landscapes in the Hispanic world has always been a tenuous concept since the colonialist “invention” of Latin America. This did not cease with the vast modernization and economic growth of the nineteenth century, as the control over resources and political hegemony shifted toward US state- and business-backed ascendency. Nevertheless, the esthetic advancement ushered in with the modernista movement began the lengthy process of autonomous cultural practice and renovation in Latin America. Alejandro Mejías-López’s recent study aims to remap the dynamics of cultural and geopolitical power from “ineffective” models, such as the conceptualization of uneven modernity and models of center and periphery at the turn of the twentieth century (40). He expresses that “The importance of nineteenth-century remapping of the West cannot be overemphasized and is worth exploring further, as it sheds new light on Spanish America’s place on this map, on our own understanding of its experience of modernity, and on the project of Spanish American modernism” (40). The maps created for this study contribute to Mejías-Lopez’s project thorough visualizing cultural production of the period. This framework breaks down notions of Western centrality by illuminating Latin American immersion in world cultures through literary works. In the maps here, the use of representations from Greece, Japan, China, India and Africa in a distinctly Hispanic poetics places the region geographically and esthetically between the poles of East and West. Additionally, the publishing cartographies display a widespread transatlantic and transnational industry that helped to set into motion modernista cultural authority and prestige in the Hispanic world and beyond.6 This esthetic project, then, traverses the experience of modernity toward a complex dynamic of hybrid and mixed literary expression, and the modernization of a culture industry that situated this group of Latin American writers in the tracks of mass production and wide dissemination across the Americas and Europe. These dynamics become clear in the plotted textual and production-based elements and assist in the work of remapping Latin American culture at the fin de siglo. In his study of the cartographies of modernista literary style, Rodrigo Javier Caresani figuratively maps out the narrative voice at two decisive moments in Darío’s career: the poet’s period in Buenos Aires, beginning in 1893, and then his European residency, following 1898. He points to the fact that “antes que una instancia monolítica, [la voz narrativa] resulta afectada por las condiciones culturales, pero también históricas, económicas, políticas, geográficas, etc.—desde las que se enuncia” (69). Echoing Ángel Rama, Caresani titles the network of influences surrounding Darío’s literary production the “sistema modernista” (67). The visual maps of this study add to the socio-historical corpus of critical modernista readings and aim to complicate the spatial analysis of both symbolic geographic gestures and overt places of literary production and publication. Through visual mapping, the modernista system becomes visibly extra-national, stretching the boundaries of textual geography and the territorialization of Latin American literary publishing. In a sense, the visualizations indicate something that we have known all along – that Latin America has always been a global construct, a widespread intersection of geographies. Modernismo, as the first cohesive literary movement to emerge from the region, represents this globalism well, doing justice to what has been effected by those in power since colonization: an intrepid search for encounters, esthetic experimentation and an expressive, rhetorical integration with the world map. In this investigation, modernista cultural authority is reiterated in spatial terms as the maps plot pathways demonstrating that Latin American writers sought centers of textual power and evolved toward Europe where their voices “mattered” more than their own regional conceptualizations of cultural authority. Indeed, following Mariano Siskind’s recent work, “when the modernistas gave a voice to the world literary subject (even when it coexisted in them with particularlisic voices), there was nothing foreign to them. They never saw the cultures of distant regions as alien Others; rather, they saw them as triggers of their desire to escape belatedness and exclusion” (122). The geographic and lyrical immersion in global spaces places modernistas in a continuous search for the modern – a modernity that was global, inclusive and cosmopolitan. Modernista desire highlights the tension between the regional and the global. Likewise, the map images reveal the transfer of global poetic influence as well as an economic marketplace that traversed regional boundaries. Their poetic and publishing geographies aimed globally, as the maps present the poets as discoverers in their own right that sought to explore the spaces and discourses of lands abroad. The sistema modernista attempted to construct a cultural essence based on this extra-national seeking after form and space with a public backing and cultural momentum that propelled its cultural authority over several decades. Modernismo, as a movement profoundly impacted by global literature, history and culture, often sought out references extraneous to the local and regional. Representation of the spatially explicit grounds modernista poetry in the foreign and also brings to light the authors as far-reaching readers with an ability to take from the archive of world letters to create something original that interacts with their own experience of modernity. This cartography of literary integration, if nothing else, points to the wide web of intertextuality inherent in much modernista poetry. Consumers of modernista verse were truly immersed in a globalized literary landscape. This is manifest in both Darío’s Prosas profanas and Nervo’s En voz baja as two representative books of modernista poetry published about a decade and a half apart in 1896 and 1909 respectively. The construction of literature and place in the books is evident in the displayed maps, yet there is a glaring absence of both poets’ home countries, Mexico and Nicaragua. Although both represented their countries throughout their lengthy careers through various state-sanctioned diplomatic roles, both writers’ home nations as poetic tropes consist of a small fraction of the mentioned spatial references. In fact, the place of the state in modernismo is a contested concept. In this sense, Cathy Jrade remarks that the modernistas “were the first to live the perhaps irreconcilable tension between the search for a spiritual community and a sense of national identity, on the one hand, and a longing to participate in the world arena, on the other” (5). Most modernistas worked, traveled and at times fought for and defended their states of origin. Yet they also sought work and travel opportunities away from home. Darío was always Nicaraguan and Nervo never shed his identity as a Mexican poet, yet their spiritual and literary communities located abroad were often more prominent in their poetry. Darío could not leave Nicaragua soon enough as a youth and though it took longer for Nervo to leave Mexico, he spent many years abroad amongst a transatlantic literary world in Paris and Madrid. The maps tell yet another different story. For Valera, if not for the language of Azul… the text could have been produced by any European writer. He contributes his own spatial metaphor, assigning Darío’s very name to the cosmopolitan characteristics of the text. Yet Darío’s mestizo background is far removed from Jewish or Persian ethnicities; nevertheless, the “spirit” of the book traverses global spaces. Valera points out that although the name could be “contrahecho y fingido,” this advances the cosmopolitan nature of the text. The act of adoption, of crossing world boundaries in finding and perpetuating one’s expression is a hallmark of the movement.7 This “cosmopolitan spirit” is trenchant in Prosas profanas and En voz baja. The first map is a representation of space in Nervo’s 1909 poetry collection En voz baja (Figure 1). 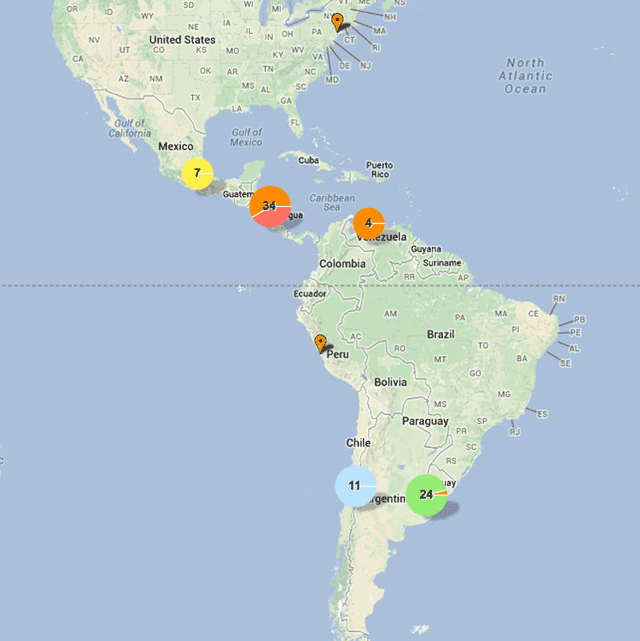 The plotted sites are represented through actual location names, references to figures and writers and their work, such as Shakespeare and Beethoven or Mexican priest Francisco Pintado de Cienfuegos. Also mapped are references to regions through religious characters and mythologies from the likes of Walhalla, the paradise of Scandinavian mythology, to Brahma, the Hindu god of creation. In addition, I have also mapped explicit site names in the book, resulting in ninety-nine total references – the sum of which results in a visualization heavily centered in Europe. Although it may be of no surprise that a modernista poetry edition is profoundly influenced by European cultures, writers and spaces, the map makes explicit the relationship between Latin American and European spatial representation. The visual is overwhelming in this regard. Américo Castro said of Nervo, “México nos ha dado en Nervo un poeta de profundas resonancias: en su estilo percibimos el latido de lejanas y misteriosas civilizaciones” (qtd. in Leal 493). Castro’s impression is realized for Nervo’s Spanish American readers as we lay out the spatial plot. The map provides a concrete indication of the truly cosmopolitan poetics of En voz baja. Contrastingly, Nervo represents the book in far more subtle terms. He writes that En voz baja “será un libro exclusivamente de tono menor, en el que no hay que buscar ni sonoridades, ni oratorias, ni conceptualismo, es la Vida, en lo que tiene de enigmático, de insinuante y bellamente impreciso, que pasa cuchicheando por estas páginas” (qtd. in Martínez 56). Following Nervo, the map represents, at least partially, “la vida modernista,” a life influenced by international spaces with a significant concentration in Europe. In this case, there are seventy-four European references in comparison to nineteen references to the American continents. Viewing this map as an introduction to En voz baja provides a visual framework for “seeing” the literary spaces of one of the most prominent and popular Latin American writers at the fin de siglo. It assists in understanding Nervo’s international appropriations and inspirations for his poetics and shows how modernista poets were in extensive dialogue with Europe and beyond in the creation of their cultural capital. Spatial and Geographic representations in Nervo’s En voz baja, Paris: Ollendorf, 1909. Similarly, Darío’s Prosas profanas exudes cosmopolitanism and global intertextualities. In contrast to Nervo’s text, Darío’s is replete with mythological references. Greek and Roman influences impact nearly every poem. The difference in number of spatial references is also worthy of note. While Nervo’s book had ninety-nine references to geospatial place, Prosas profanas contains 410 references (Figures 2, 3 and 4). Most of the poems in the collection are agglomerations of historical, mythological and global geographies. The reader truly becomes a traveler, with both the ancient and contemporary worlds in her/his reach. The map plots out an excess of Roman and Greek spaces, and through the visualizations these ancient cultures can be seen as foundational to the content of the text based on number of references alone, as 50 percent of the spatial mentions in the book refer to the two countries. Differing from the influence of classical culture on Romanticism and Parnassianism, the mythology of Prosas profanas is situated in diverse and often cosmopolitan settings. Figure 2 indicates the great divergence of place and an intersection of ancient western depictions with more modern American representations as exemplified in “Canción de carnaval”: “con la citara sé griega;/o gaucha, con la guitarra/de Santos Vega” (37). The Classic and Hispanic also repeatedly come together in “Pórtico”: “Una andaluza despliega su manto/para el poeta de música eximia;/rústicos Títiros cantan su canto;/bulle el hervor de la alegre vendimia” (82). In this case, the Greek region of Titiros and the multitude harvesting grapes are directly affected by an Andalucian woman opening up her cloak. The continual traversal of space and time throughout Prosas profanas is further evidenced in the map, as 177 of 205 references to the Greek and Italian regions refer to classical mythological images and spaces. In this way, Prosas profanas is Darío’s manifesto on Latin America’s integration into not only the contemporary global culture of the fin de siglo but also a renovation and interruption of historical poetics, allowing modernismo a place at the table in a rich intertextual tradition going back more than two millennia. 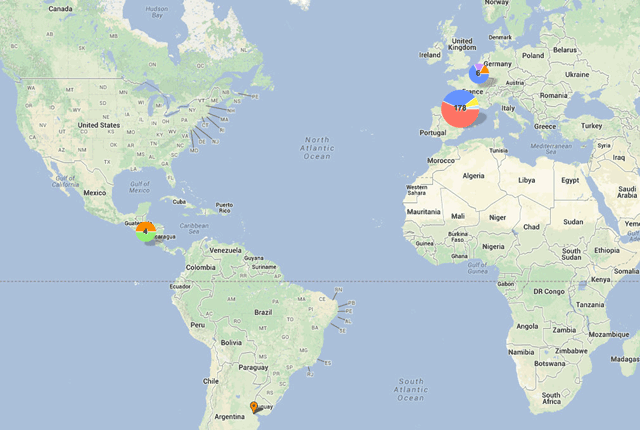 Clustered view of spatial representations in Prosas profanas on global map. Latin American spatial representations in Prosas profanas. European and Asian representations in Prosas profanas. According to the poet in his “Historia de mis libros,” Darío wrote Prosas profanas to demonstrate “que no solo de las rosas de París extraería esencias, sino de todos los jardines del mundo” (144). Darío extends the cosmopolitan metaphor to individual poems in the collection: “En ‘Divagación’ diríase un curso de geografía erótica; la invitación al amor bajo todos los soles, la pasión de todos los colores y de todos los tiempos” (“Historia” 145). This globalizing manifestation is reinforced by the Prosas profanas map, as the data points extend around the globe. However, as mentioned, there is a major concentration in the classical mythologies of Greece and Rome in the text. Darío explains that “Son ecos y manera de épocas pasadas, y una demostración, para los desconcertados y engañados contrarios, de que para realizar la obra de reforma y de modernidad que emprendiera he necesitado anteriores estudios de clásicos y primitivos” (“Historia” 148). Although the well-known Valera reading of the modernista’s 1888 work Azul… allowed Darío’s work to extend into the Spanish literary field across the Atlantic, it was through Prosas profanas that the poet secured his prestige in Latin America and abroad. It is an erudite book and Darío wanted it that way, as he desired to make his mark through a profound sense of artistic taste and high esthetics: “era preciso la base del conocimiento del arte a que uno se consagraba, una indispensable erudición y el necesario don del buen gusto. Me adelanté a prevenir el prejuicio de toda imitación, y, apartando sobre todo a los jóvenes catecúmenos de seguir mis huellas” (“Historia” 143). Darío had attracted a strong following based on his religious-like study of present and past cultures. He prided himself on the inability to be imitated, precisely because his expression purported to surpass that of others as a result of his intense knowledge of world mythologies, literatures and cultures. In the following network graph, the six geographic regions mentioned most in Prosas profanas are visualized. Of 409 references, 311 refer to these 6 locations. There are 141 mentions of Greece, 64 of Italy, 48 of France, 38 of Spain, 14 references to Argentina and 13 to Germany (Figure 5). There are 51 different geographic locations in the text with more than 75 percent referring to these six regions. In Prosas profanas there are over 400 references to foreign space that communicate this rather self-important “indispensable erudición” of Darío’s work. The map and graph show that his erudition regarding foreign space is almost hyperbolic, an exaggerated cultivation and refinement of knowledge. Network graph of top six geographic references in Prosas profanas. If followers were what he was after, this overt, almost anti-American spatial locus worked. Stepping away from the criollo and nationalist literary traditions of Latin America toward a bookish and erudite focus, the publication of Prosas profanas single-handedly placed the modernista movement to the forefront of the Hispanic literary field on both sides of the Atlantic.8 The map begs the question: how did something that so clearly gazes away from the Americas help modernismo gain so much cultural traction? Graciela Montaldo writes that “Los modernistas transitan por la cultura de los otros con la seguridad que les confiere su falta de ataduras culturales” (55). The cosmopolitanism of modernista writers granted them wide access to seize global cultures and create a hybridized conglomeration of textual elements in their poetic expression. In this way, continues Montaldo, “El trabajo de Darío consiste no en respetar una cultura en su letra sino de descontextualizarla, sea cual fuese su procedencia” (57). The concept of decontextualization, exploration, sensation, discovery and esthetic freedom clearly attracted wide readerships in the region and abroad and this attention helped to foster key relationships with those in power. Editors, state officials, other literatos and wide travel experience are factors that explain the multifaceted sistema modernista. In addition, the fashion for a highly symbolic and foreign-based poetics assisted in creating a celebrity culture in the world of letters of the period that centered on modernista writers. Clearly, the study of these maps is incomplete. What is the relationship between spatial representations and the naming of international figures, literatures, mythologies and historical events? Does geographic space even matter when we discuss such an estheticized genre as poetry? The multitude of references to Italy, Germany and Great Britain, in contrast to Mexico, in Nervo’s text signifies the poet’s search for exterior references to create poetry. From the relationships illustrated on the maps and graphs emerge connections that may go unseen when reading the text itself – particularly when discussing an edition of poetry, usually read in fragments and not as a whole. At the very least, the visual content provides an extra tool of hermeneutic power, as we continue to approach modernista poetry. The maps point to notions of the breaking down of national borders in the search for commonality in artistic expression. Modernistas were not only extensive travelers but also discursive and literary pilgrims, crossing nations and continents in the creation of something new, modern and distinctly their own. Yet, as the mapping images demonstrate, this self-aware freedom of space possesses a geography; a spatiality that is widespread, eclectic and deeply extra-national in scope. Modernistas were first-rate journalists, and the vast majority of their literary production was printed on the newspaper page, much of it now hidden in periodical archives. The cartographies of journalistic production are as vast as the complex and hybrid crónica genre. Moretti writes that in maps “spaces interact and compete for attention,” (Graphs 49) similar to the spatiality on the newspaper page or the thematic elements in a crónica modernista. Rubén Darío, from the mid-1880s to his death in 1916, was the public face of modernismo – so much so that Max Henríquez Ureña said that Darío “resume y representa […] todas y cada una de esas etapas del movimiento” and that “El modernismo, ya cumplida su misión [de renovación literaria], murió con él” (114). Darío sits at the core of the literary field and his journalistic production is an effective gauge of the truly transnational and transatlantic reality of the movement. 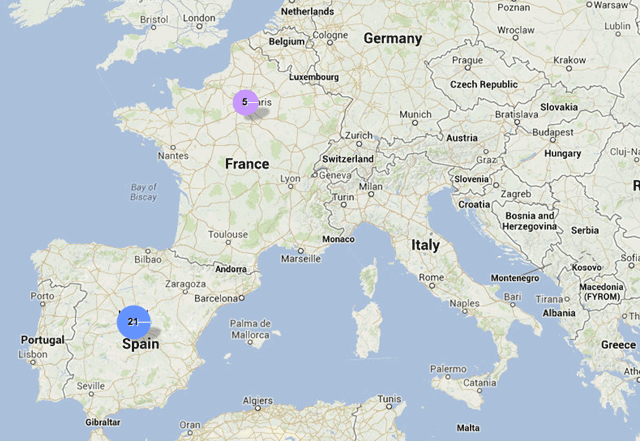 The following maps represent a survey of locations of periodical collaboration during the poet’s lifetime (Figures 6, 7, 8 and 9). Over the course of a decade, I have been recording publication venues and place names and, to the present moment, have found that Darío’s work was published in at least one hundred periodicals. In comparing this map to the poetic cartographies seen earlier, we obtain a different spatial visualization representative of the movement. Darío’s journalistic participation was widespread, with an unsurprising concentration in Central American publishing. 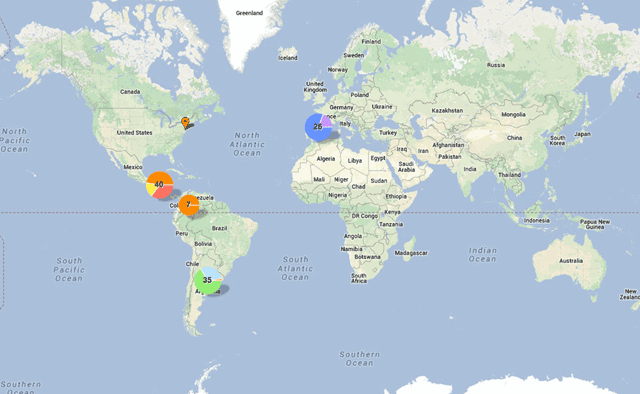 Global map of Rubén Darío periodical participation. Rubén Darío periodical participation in the Americas. Rubén Darío’s European periodical participation. Network graph of Darío’s sites of periodical collaboration. Up until his death, Darío was committed to the struggle of repeatedly producing journalistic texts and he continually sought out opportunities to publish his journalism. This focus on the “conditions” of journalistic cooperation echoes Aníbal González’s declaration that “la crónica está sujeta e exigencias de actualidad, de novedad y a lo que podríamos llamar ‘leyes de oferta y demanda’, ya que, desde el punto de vista del periodismo, la crónica es una mercancía” (75). The multinational literary marketplace of the turn of the twentieth century is on full display in Figures 6, 7, 8, 9. Susana Rotker suggests that the journalistic crónica is an “Arqueología del presente,” (123) and these maps and the network graph in Figure 9 allow us to question the state of the literary field through the movement’s most prestigious writer. They open up questions of readership, of modernista textual dissemination, of the centrality of journalistic publications in the literary production of the movement, of the Latin Americanism visualized through Darío’s publication experience, and of the absence of his publications in Bolivia, Paraguay, Ecuador and Brazil.9 Nevertheless, as we imagine modernista geographies through visuals such as these, levels of transnationality and transatlanticism come into focus as well as the modernization of print and communication technologies at the turn of the twentieth century. Darío wrote that “hoy, y siempre, un periodista y un escritor se han de confundir. La mayor parte de los fragmentarios son periodistas” (“El periodista…” 219). The blurring between writer and reporter is further confirmed through the construction of these maps. The idea of writer or thinker as “fragmentario” articulates well the hybridized identity and geographic diversity inherent in the career of the modernista writer. Like newspaper publishing, the modernista book market also flourished. There may be no better example of extensive book production than the career of Guatemalan Enrique Gómez Carrillo. During his lifetime, he published at least 190 volumes, depicted by the geographical sites of publication in the next map (Figure 10).10 This map is striking on several levels. Over half of his editions were published in Madrid, and sixty-two in Paris. Those two cities alone account for 85 percent of his book publications. Only six of the 190 were published in Latin America (Figure 11). This may be unsurprising to some, given that Gómez Carrillo left Guatemala at the age of nineteen never to return to live in the Americas. Enrique Gómez Carrillo’s sites of book publication. 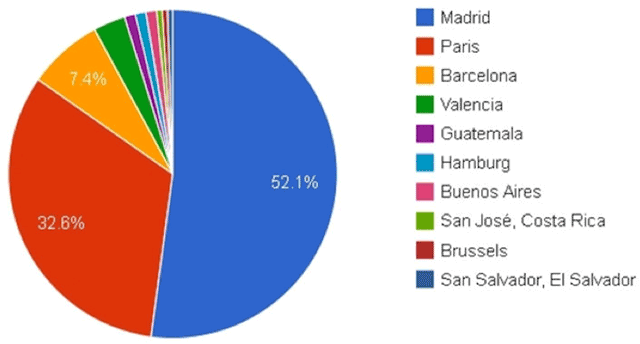 Chart of Gómez Carrillo’s places of book publication. Most of Gómez Carrillo’s book editions were collections of his journalistic work. As a prolific cronista, in the Madrid publication El Liberal alone, the Guatemalan published over 2,800 articles over the course of two decades, enough to fill over a hundred books. His consistency of publishing is remarkable, as he continued to publish in Spain’s most prestigious newspapers up until his passing in 1927. Cultural authority as a Latin American writer never evaded Gómez Carrillo, as he was constantly seeking new avenues of expression – both thematically and in terms of his textual venues and geographically wide publishing network. He reflected the modernista attitude that if authors had a chance to write and publish, they sought after those opportunities. Moreover, his journalistic dissemination was just as geographically expansive as Darío’s. Book editions, for modernista writers, symbolized a consecration of their literary work. Ericka Beckman writes that “modernismo pioneered an aesthetic language of commodity consumption” in Latin America (45). Following Beckman, I would argue that Gómez Carrillo converted his book editions into literal estheticized commodities through his extensive publication record. This commoditization did not occur through the mass production of print numbers of each edition, because each volume most likely was limited to print runs of five hundred to one thousand copies. Instead the repeated esthetic production and the output of several books year after year coincided with the fetishization of the esthetic object so prominent during modernismo. Darío wrote that “Los impresores y los encuadernadores son los arquitectos de las ideas congregadas” (“La casa” 82). In this way, even book printers and binders gained discursive and esthetic authority in the literary process. Gómez Carrillo expressed that, “Lo único que queremos es que nuestras obras, buenas o malas, sean publicadas por nuestros editores y vendidas por nuestros libreros. Es un problema comercial, en suma, el que se trata de resolver, y no un problema artístico” (“El problema…” 1). Gómez Carrillo seemed to overcome his own “problema comercial” through his repeated publication. This leads us to a central question explored by critics of the movement: What does this professionalization mean for modernista esthetics and literary autonomy? 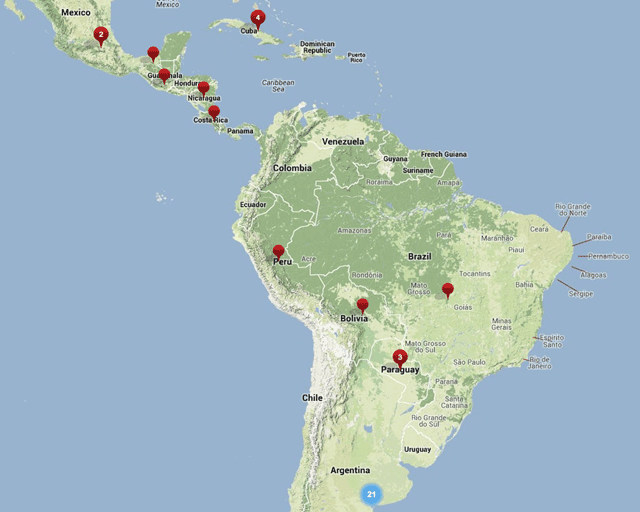 The maps reveal the intense market-based interests of writers central to the movement and the willingness to be immersed in foreign markets to advance Latin American literature. Based on the Gómez Carrillo maps, a future study may propose: How does this map compare with the book publication of other modernistas? Carlos Monsiváis wrote that “Nervo consigue ver publicados en México casi todos sus libros, y eso no es frecuente en una industria editorial muy débil en el período” (92). The book culture and publishing possibilities for literatos of the period reflect a globalization which expanded national poetics toward readerships that traversed American languages, historiographies and economic ties. Tools of data collection and mapping prompt a greater understanding of the narrative of the modernista movement. Instead of leading to unambiguous and objective results, mapping spatial elements of the period guides us to further questions that have the potential to open up literary history to lines of inquiry that are not yet fully explored. Carlos Díaz Dufoo, founder of Mexican Revista Azul with Manuel Gutiérrez Nájera, ironically lamented: “El dolor de la producción es una enfermedad que mina a la moderna labor de arte. Arrastramos penosamente una cadena que estorba nuestros movimientos. Y sin embargo, no queremos evadirnos, no pretendemos la libertad, ¡amamos nuestro presidio!” (210). These chains of production allowed for the global dissemination and esthetic cultivation evident in the texts and cultural production analyzed here. The desire to announce and expand their literary revolution was successful through modernista publishing efforts as well as through the innovative poetics, which appealed to regions in the wake of a push toward global modernity. Textual production, dissemination and industry, though seeming to place modernista writers on the edge of artistic compromise, also entrenched them in their literary endeavors. Textual mapping sheds additional light onto this “beloved prison” of the movement. 1See Susana Rotker’s Invención de la crónica for an enlightening thesis on the discursive power of modernista journalism and the importance of its study. She writes that this “permite – a través de la crónica como punto de inflexión entre el periodismo y la literatura – considerar elementos como arte y noción de funcionalidad (interés por un hecho); la referencialidad propia del periodismo despegada del aislamiento ‘elevado’ que pretendió imponerse con el ‘artepurismo’” (25). For other extensive analysis on the movement’s journalism and particularly the crónica genre see Gutiérrez, González, Pineda Franco, Ramos and Reynolds. 2The idea of “inverted conquest,” originally proposed by Venezuelan modernista Manuel Díaz Rodríguez, has recently been the theme of Alejandro Mejías-López’s book on the transatlantic modernity of the Spanish American literary and cultural fields at the turn of the twentieth century. 3For all maps except the Prosas profanas map, I used the online mapping program Batchgeo. 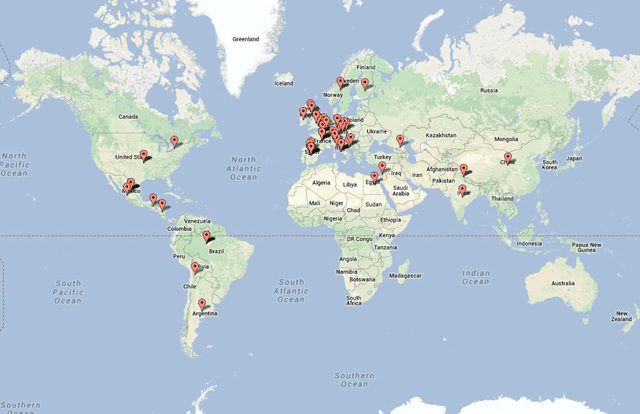 I created the Prosas profanas map with the Maptive program. The two network graphs in the study were created with Google Fusion Graphs. 5See Raymond Craib’s important work on Latin American cartography. He writes that historically “Cartographic projects were also part of a larger esthetic project designed to bridge the distance between a multiplicitous reality and the desired goal of unity and wholeness. The maps produced would presumably improve understanding and prove possession but also provide an illusion of control from a distance, control of the periphery by the metropolis and control of the ‘empire’ by a central authority” (17). In the visualizations of this article, modernismo represents a post-colonial region disjoined by several nation-states. The literary maps suggest further hybridization of cultural and national power and lack of central control as preeminent writers went about their work. 6Ángel Rama emphasizes that turn of the century thinkers attempted to “map” themselves both locally and globally. He writes that “intellectual innovators of the day tried to inscribe themselves on a universal map, but in a manner reflective of the particularities of Latin American experience, without losing sight of local horizons” (81). 7See Jaime Hanneken’s “Going Mundial: What it Really Means to Desire Paris.” She explains: “to grasp the universality and autonomy of Paris – as well as of Latin America – we must grasp their moral force as popular convictions while refusing to be persuaded by that force: indeed, this dynamic tethers the belief in literary universality, as a field of value, to the hegemonic relation without reducing it to a simple relation of power” (152). In the case of this article, universality in literary expression can be plotted, seen and connected to Mundial Magazine, studied in Hanneken’s piece. Mundial, then, as Hanneken writes is not solely an “incidental repository for other literary forms” (152) but an artistic, economic and print manifestation of modernista intentionality that began decades earlier in Darío’s own poetry. 8One study calls it “Darío’s poetic eruption” (Acreda and Durusha 19); another states that the book “forges a view of literature that assertively claims a crucial role within Spanish American society. Modernismo seeks to provide a vision of ultimate truths that would counter not only the positivist critique of religion but also the materialistic and pragmatic values predominant in modern life. It aspires to create a revitalized language appropriate to the new era that Spanish America had entered by embracing and transcending the beauty of art from across the ages and around the world” (Jrade 81). 9Through archival research, I have gathered thousands of pages of periodical documents. With this research, I have recorded Darío’s participation in journalism throughout Latin American and across the Atlantic. Publication information is also available in anthologies and collections such as José María Martínez’s Cátedra edition of Darío’s Cuentos and Günther Schmigalle’s carefully researched editions of Darío’s prose and journalism. 10These numbers come from the extensive work of Juan Manuel González Martel on the life and publications of Gómez Carrillo. Asunción Silva, José . (1990). “De sobremesa.” In: Orjuela, Héctor H. (ed. ), Obra completa. Madrid: Consejo Superior de Investigaciones Científicas, pp. 227–352. Print. Beckman, Ericka . (2012). Capital Fictions: The Literature of Latin America’s Export Age. Minneapolis: U of Minnesota P, DOI: https://doi.org/10.5749/minnesota/9780816679195.001.0001 Print. Caresani, Rodrigo Javier . (2010). “Hacia una cartografía de la poética dariana.” In: Repertorio dariano 2010: anuario sobre Rubén Darío y el modernismo hispánico. Managua: Academia Nicaragüense de la Lengua, pp. 63–88. Print. Craib, Raymond B. . (2000). “Cartography and Power in the Conquest and Creation of New Spain.”. Latin American Research Review 35(1): 7–36. Print. Darío, Rubén . (1943). “A Nicolas Rivero, Director del Diario de la Marina, de La Habana.” In: Ghiraldo, Alberto (ed. ), El archivo de Rubén Darío. Buenos Aires: Editorial Losada, pp. 483–4. Print. Darío, Rubén . (2006). Schmigalle, Günter (ed. ), Crónicas desconocidas (1901–1906). Berlin: Tranvía. Print. Darío, Rubén . (2006). Martínez, José María (ed. ), Cuentos. Madrid: Cátedra. Print. Darío, Rubén . (2006). “El periodista y su mérito literario.” In: Impresiones y sensaciones. Sevilla: Extramuros Edición, pp. 219–20. Print. Darío, Rubén . (1991). “Historia de mis libros.” In: La vida de Rubén Darío escrito por el mismo. Caracas: Biblioteca Ayacucho, pp. 135–58. Print. Darío, Rubén; Mapes, E. K. . (1938). “La casa de las ideas.” In: Escritos inéditos de Rubén Darío. New York: Instituto de las Españas, pp. 82–84. Print. Darío, Rubén . (1979). Prosas profanas. 9th ed. Madrid: Espasa-Calpe. Print. Díaz Dufoo, Carlos . (1895). “El dolor de la producción.”. Revista Azul August 4 18953(14): 209–10. Print. Gómez Carrillo, Enrique . (1916). “El problema del libro Español.”. El Liberal, November 8 1916: 1. Print. Gómez Carrillo, Enrique . (1997). “La psicología del viajero.” In: Crónicas e impresiones de viaje. Guatemala: Artemis-Edinter, pp. 3–19. Print. González, Aníbal . (1983). La crónica modernista hispanoamericana. Madrid: Porrúa Turanzas. Print. González Martel, Juan Manuel . (2013). “Enrique Gómez Carrillo: Obra literaria publicada en libro – Segunda edición revisada y aumentada.”. Asociación Enrique Gómez Carrillo, April 3 2013 Web. Gutiérrez, José Ismael . (2007). Perspectivas sobre el modernismo hispanoamericano. Madrid: Editorial Pliegos. Print. Hanneken, Jaime . (2010). “Going Mundial: What it Really Means to Desire Paris.”. Modern Language Quarterly June 201071(2): 129–52, DOI: https://doi.org/10.1215/00267929-2010-002 Print. Harley, J. B. (1989). “Deconstructing the Map.”. Cartographica Summer;26(2): 1–20, DOI: https://doi.org/10.3138/E635-7827-1757-9T53 Print. Harley, J. B. (2009). “Maps, Knowledge, and Power.” In: Henderson, George, Waterstone, Marvin Marvin (eds. ), Geographic Thought: A Praxis Perspective. London: Routledge, pp. 129–48. Print. Henríquez Ureña, Max . (1962). Breve historia del modernismo. 2nd Ed. México: Fondo de cultura económica. Print. Jrade, Cathy L. . (1998). Modernismo, Modernity and the Development of Spanish American Literature. Austin: U of Texas P. Print. Leal, Luis . (1990). “Situación de Amado Nervo.”. Revista Iberoamericana July–September 199072: 485–94, DOI: https://doi.org/10.5195/REVIBEROAMER.1970.2425 Print. Martínez, José María . (2002). “Introducción.” In: Nervo, Amado (ed. ), En voz baja. La amada inmóvil. Madrid: Cátedra. Print. Mejías-López, Alejandro . (2009). The Inverted Conquest: The Myth of Modernity and the Transatlantic Onset of Modernism. Nashville: Vanderbilt U P. Print. Monsiváis, Carlos . (2002). Yo te bendigo vida. Amado Nervo: Crónica de vida y obra. México: Gobierno del Estado. Print. Montaldo, Graciela . (1994). La sensibilidad amenazada: Fin de siglo y modernismo. Buenos Aires: Beatriz Viterbo Editora. Print. Moretti, Franco . (1999). Atlas of the European Novel 1800–1900. London: Verso. Print. Moretti, Franco . (2005). Graphs, Maps, Trees: Abstract Models for a Literary History. London: Verso. Print. Nervo, Amado . (2002). Martínez, José María (ed. ), En voz baja. Madrid: Cátedra. Print. Pineda Franco, Adela . (2006). Geopolíticas de la cultura finisecular en Buenos Aires, París y México: las revistas literarias y el modernismo. Pittsburg: Instituto Internacional de Literatura Iberoamericana. Print. Rama, Ángel . (1996). Chasteen, John Charles (trans. ), The Lettered City. Durham: Duke U P. Print. Reynolds, Andrew . (2012). The Spanish American Crónica Modernista, Temporality & Material Culture: Modernismo’s Unstoppable Presses. Lewisburg: Bucknell U P. Print. Rotker, Susana . (2005). La invención de la crónica. México: Fondo de cultura económica. Print. Siskind, Mariano . (2014). Cosmopolitan Desires: Global Modernity and World Literatures in Latin America. Chicago: Northwestern U P. Print. Torres, Edelberto . (1990). La dramática vida de Rubén Darío. Guatemala: Universitaria centroamericana. Print. Underwood, Ted . (2013). “We don’t already know the broad outlines of literary history.”. The Stone and the Shell, April 3 2013 Web. Valera, Juan . (2002). “Carta de Juan Valera a Rubén Darío.” In: Darío, Rubén, Belmás, Antonio Oliver Antonio Oliver (eds. ), Azul…, El salmo de la pluma, Cantos de vida y esperanza, Otros poemas. México: Editorial Porrúa. Print.